Flash Burnout by L.K. Madigan. Houghton Mifflin Books for Children. 2009. Reviewed from ARC borrowed from a friend. Morris Award finalist. The Plot: Blake, 15, has a GF (girlfriend), Shannon; and a girl who is a friend, Marissa. It seems possible to have two women in his life, despite the jokes his brother makes, until he discovers a secret about Marissa that he promises not to tell anyone. The Good: A perfect romance, written from a teenage boy's point of view. Blake really likes Shannon, even eventually saying the "l" word. He's trying to figure out how to be a good boyfriend, what to say, what not to say, to ignore the "advice" of his brother and friends that say, don't be so into her, ignore her sometimes. Blake also really likes Marissa, but just as friend. And that's true; it's Shannon he is in love with, it's Shannon he cannot get enough with, loves her shoulders, the feel of her skin, the way she smiles just for him. Marissa is his buddy in photography class, a friend. Want to know the difference between feeling friendship for a person and something more? It's in the details of Blake's interactions with and thoughts about both Shannon and Marissa. This is NOT one of those stories where the best-friend-who-is-a-girl becomes something more, or the girlfriend turns out to be a shallow undeserving bitca. It's about three nice, likable, teenagers: Blake, a photographer who is always cracking jokes; Shannon, who plays soccer and plays the piano and is strong and sort of confident but also not quite sure how to handle her first real relationship; Marissa, a photographer, living with her grandmother and haunted by her past. Blake gets involved with Marissa's heartache inadvertently. He takes a photo of a homeless woman who turns out to be Marissa's meth addicted mother. Her mother, Anne, isn't evil or bad; she is an addict whose addiction and sadness overwhelms her and her family. If someone is drowning, when do you try to save them? When do you concentrate on saving yourself? Blake promises not to tell anyone about Marissa's family, and this secret becomes a problem with Shannon. He cannot share with Shannon why he is there for Marissa, spending time with Marissa. 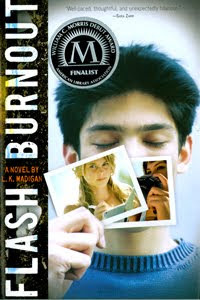 Flash Burnout manages to be both hilarious and touching, as Blake figures out his relationships with others and also how his actions have consequences. Blake's parents are terrific; his mother is a hospital chaplain, his father a medical examiner. They are supportive but not pushovers. In addition to interesting career choices, both jobs add to the plot line. When Blake goes looking for Marissa's mother, his mother turns out to know about the homeless in town and where they may be because of her job. Likewise, his father's job also factors into the search for the missing woman. I'm adding this to my favorite books read in 2009; and it's easy to see why this made the Morris Award shortlist. Yes, of course it's because of the plot, and the deft handling of serious issues and everyday issues, and supporting characters who are well rounded; but it's also (in my opinion, I have no connection to the Committee!) the character and portrayal of Blake. Blake is so real, from his humor, his point of view, his attraction to Shannon, that at times I thought Blake was real and the author had just invited him to his house, given him some cheese and caramel popcorn, and transcribed Blake's words. Thanks for the lovely review, Liz! This looks like a great read, I can't wait to get a hold of it and get to it. Thanks for the tip, Liz. I'm adding this to my wishlist. From your review, it'll go near the top of the list. Books from a teen boy POV are few and far between. This sounds great, will give it a go. Thanks! So glad you enjoyed this one! I don't think I've read a bad review yet. It seems like a quiet novel, which I just love. The characters sound completely three-dimensional. Thanks for such a thoughtful review. Sounds great! I am adding this one to my list.